Image of comet Hyakutake C/1996 B2 taken 1996 Mar. 22.83 UT with a Celestron 14" Schmidt Camera (focal length of 600mm and an aperture of 350mm). Kodak TP6415 iper. film. Time of exposure 4' The picture has a field of 138'x 121' and was scanned from the negative. Two ejects are very well visible from the nucleus. The magnitude extimated (by Mauro Auteri) is 0.5, coma diameter 60' and the tail is about 10 degrees (naked eye). The comet was partly hidden by clouds. Picture by Fiorenzo Bordignon, Chiara Cattaneo, Schiaparelli Observatory, Mount Campo dei Fiori, Varese (Italy), Societa' Astronomica Schiaparelli. Image of comet Hyakutake C/1996 B2 taken 1996 Mar. 23.02 UT with a Celestron 14" Schmidt Camera (focal length of 600mm and an aperture of 350mm). Kodak Ektachrome 400 film. Time of exposure 15' The picture has a field of 255'x 176'. The magnitude extimated (by Mauro Auteri) is 0.3, coma diameter 90'and the tail is about 15 degrees (naked eye). In a 10 x50 binocular the nucleus is very bright, the tail shows several jets and a bright blue colour. At about 5 degrees away from the nucleus the tail seems split in two parts. Picture by Chiara Cattaneo, and Floriano Paglia, Schiaparelli Observatory, Mount Campo dei Fiori, Varese (Italy), Societa' Astronomica Schiaparelli. 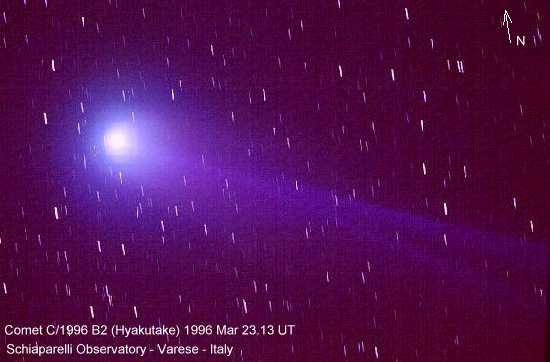 Image of comet Hyakutake C/1996 B2 taken 1996 Mar. 23.07 UT with a Celestron 14" Schmidt Camera (focal length of 600mm and an aperture of 350mm). Kodak Tp6415 with blue filter Wratten. Time of exposure 30' The picture has a field of 240'x 180'. The magnitude extimated (by Mauro Auteri) is 0.3, coma diameter 90' and the tail is about 15 degrees (naked eye). In a 10 x50 binocular the tail shows several jets and a bright blue colour. At about 5 degrees away from the nucleus the tail seems split in two parts. 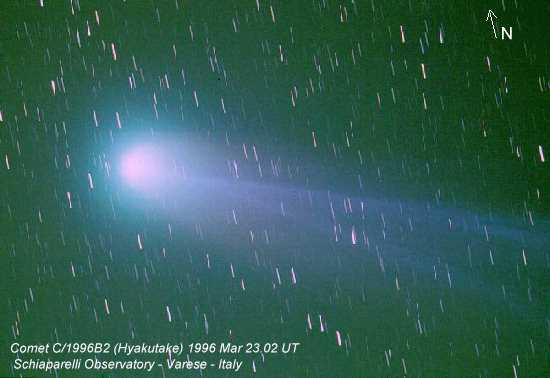 Image of comet Hyakutake C/1996 B2 taken 1996 Mar. 23.13UT with a Celestron 14" Schmidt Camera (focal length of 600mm and an aperture of 350mm). Kodak Agfachrome 200 film. Time of exposure 10' The picture has a field of 282'x 187'.